For those of you that have followed us for a while will know we have an interest in designers who take what is to hand and adapt its use to a new task, so when we recently saw a Hustler car it was clear that it is not your average motor and that is exactly why we were drawn to it. We thought it was surprisingly rational, absurd and fantastic! 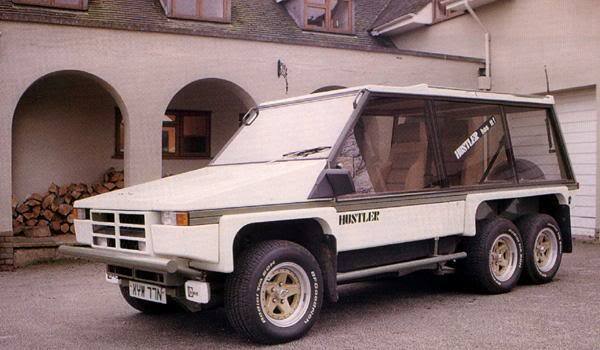 We found that the Hustler was a Mini-based project, the brainchild of Aston Martin Lagonda designer William Towns and later developed into a kit car by his Interstyl design studio. 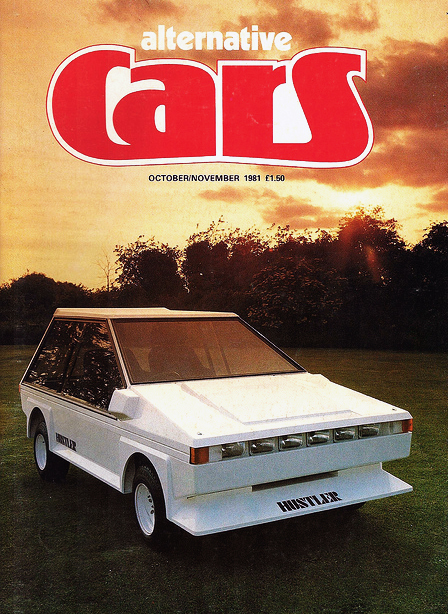 The Hustler started out as a simple yet striking modular concept devised to demonstrate that such a car could be viable for low-volume production. 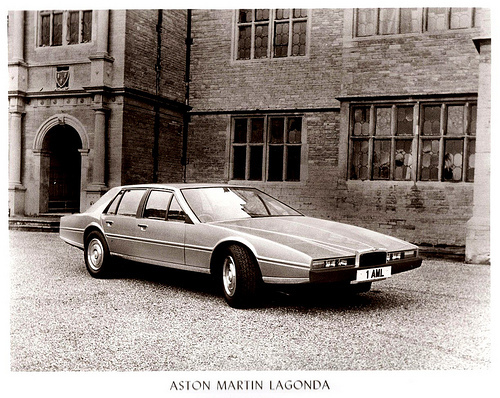 The futuristic ‘Hustler’ series of cars designed and built by Towns between 1979 and 1989 featured sharp-edged, angular bodywork reminiscent of the style of off-roader/utility vehicles, but actually was inspired by the rectilinear design language of the Lagonda. As a testimony to Town’s study of simple body construction for low volume production methods, this direct and honest approach gave rise to the car becoming up and running within three months. This was made possible by adopting the mechanical components of the British Leyland Mini, Metro or BMC 1100/1300. 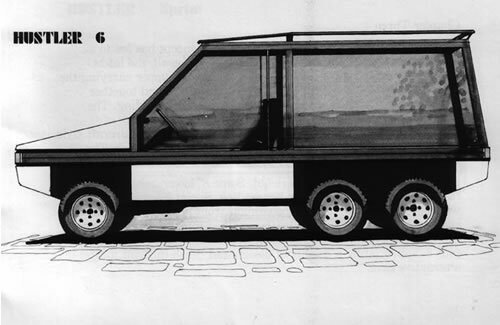 The original version of the vehicle was built using a steel monocoque of folded panels, with removable body panels in fibreglass and a roof of vinyl-trimmed marine plywood. Apparently the design for the seats was appropriated from those used in a works canteen, and the floor was covered in ribbed rubber matting. When the decision was taken to add a glove box to the dashboard, his brilliant solution harnessed the enormous potential of a ready made – this consisted of attaching a satchel attached to the flat panel dashboard. Towns also appropriated the idea of sliding windows from the mini, but did it on a much larger scale and used these as the doors entitling them ‘Windoors’. It appears that about 500 Hustlers were made in total. Needless to say, most owners chose to forego the original austere interior treatment in favour of something more comfortable. The later versions of the Hustler boasted more refinements, and perhaps sadly began to shake off the utilitarian “Works canteen” interior. Towns responded to this demand by introducing a leather-grained facia panel and headliner package, complete with aircraft-style overhead console, along with a variety of improvement to the structure and finish of the internal bodywork panels. 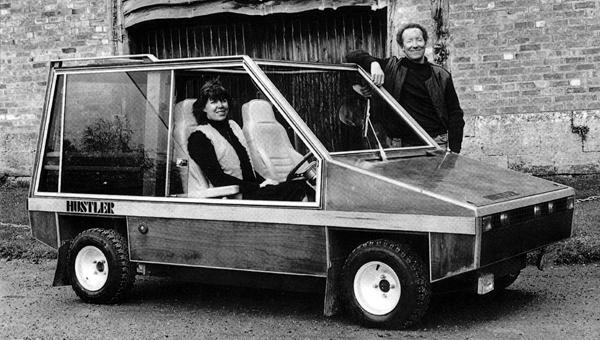 The success of the car enabled William Towns to develop an even more radical ‘kit’ version, to be constructed entirely from wood, apart from using the standard Mini front and rear subframes. Having trained as an architect, Towns calculated the stresses in timber beams and structural plywood based on the knowledge that these materials had been used to great effect in the de Havilland Mosquito, the highly successful World War II multi-role combat aircraft. The DIY ‘kit’ version of the car emerged because many people were very interested in whole concept. This version had side panels made out of mahogany ply, finished with a coat varnish and came supplied with the plans, panels, and parts needed to assemble one together. 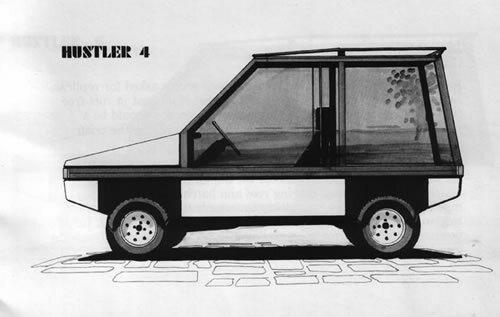 Many variants of the Hustler could be built up as a field car, an open top jeep, a flat-bed truck, a camper or as the six wheeler. Interstyl sold the ‘Hustler in Wood’ vehicle kits directly from William Towns’ home at Stretton-on-Fosse, near Moreton-in-Marsh, Gloucestershire, where his design studio was based. The ‘Hustler in Wood’, demonstrated that anyone with average joinery skills and a set of plans could produce the car’s bodywork in marine plywood as an alternative to the standard fibreglass, and Towns justifiably claimed that his increasingly prolific creation ‘grows on trees!’ The wooden version brought several practical advantages: Interstyl could sell and ship the kits more cheaply without having to include bodywork panels, while the buyer was able to specify his own grade and finish of wood at his local hardware store, with the additional prospect of cheaper repairs for minor knocks and scrapes should they occur.